Welcome to the LA Tennis Ladder. Anyone can join and the cost is $30/per year for unlimited match play. To join now, just click the BUY NOW button. This will enable you to enroll and pay your first annual dues payment of $30. 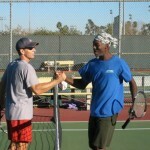 See our RULES PAGE for the additional information and complete LA Tennis Ladder rules.